Please ensure you read and retain this information sheet and exclusions list. If a covered deposit is unavailable because a bank, building society or credit union is unable to meet its financial obligations, depositors are repaid by a Deposit Guarantee Scheme. This repayment covers at maximum £85,000 per bank, building society or credit union. This means that all eligible deposits at the same bank, building society or credit union are added up in order to determine the coverage level. If, for instance a depositor holds a savings account with £80,000 and a current account with £10,000, he or she will only be repaid £85,000. c) the payment to the depositor of insurance benefits or compensation for criminal injuries or wrongful conviction. 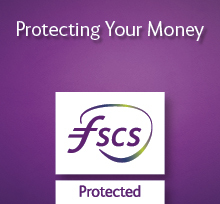 The responsible Deposit Guarantee Scheme is the Financial Services Compensation Scheme, 10th Floor Beaufort House, 15 St Botolph Street, London, EC3A 7QU, Tel: 0800 678 1100 or 020 7741 4100, Email: ICT@fscs.org.uk. It will repay your eligible deposits (up to £85,000) within 7 working days, this will increase to 20 if the case is complex, save where specific exceptions apply. 1. The holder and any beneficial owner of the deposit have never been identified in accordance with money laundering requirements. For further information, contact your bank, bank building society or credit union. 2. The deposit arises out of transactions in connection with which there has been a criminal conviction for money laundering. company5 – refer to the FSCS for further information on this category.